Sculptor Joseph Casha is celebrating his 70th anniversary and 50 years in the field of sculpture with an art exhibition. Sculptor Joseph Casha is celebrating his 70th anniversary and 50 years in the field of sculpture with an art exhibition entitled “Small is Beautiful”, consisting of 40 miniature sculptures in painted terracotta made during the last three months. The exhibition which is being inaugurated on the 21st of May is being held at the Malta School of Art to coincide with the Prize Giving Ceremony of the school. It will remain open till the 12th of June. Casha has always had a creative relationship with the Malta School of Art that has developed and changed over five decades. He enrolled as a student in the late 1950’s in the modelling class under the supervision of George Borg and studied drawing under Vincent Apap, obtaining a four year scholarship to study abroad. On his return he was appointed art teacher in Government Secondary Schools. In 1983 he started teaching sculpture at the School of Art and in 1995 he was appointed Head of school. 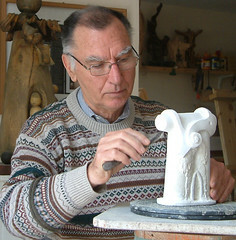 He retired in 2000 but he is still in charge of the popular 3D sculpture class. This is Casha’s first exhibition since his retrospective organised by the Bank of Valletta three years ago, curated by Mr Louis Saliba.